Go Beyond Tickets. Manage Desktops and Mobile Devices. Deploy Software, Manage Patches, and Take Control of IT Assets. 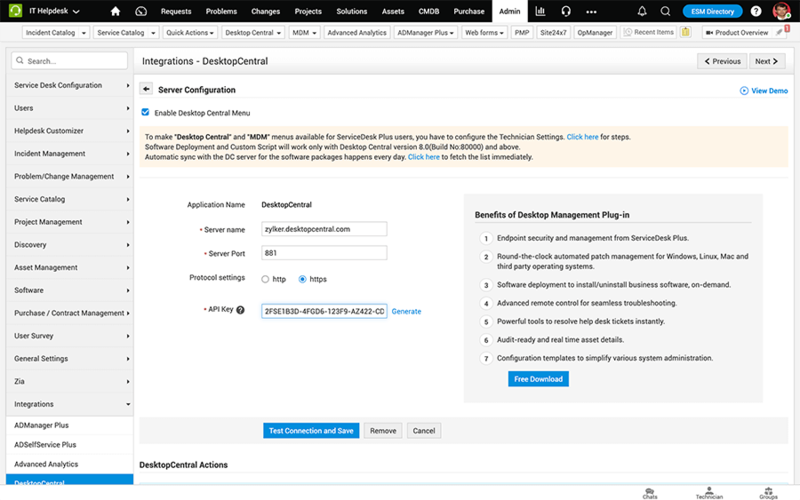 Perform desktop and Mobile Device Management activities like asset management, application management, and profile configuration from your IT service desk console. Deploy software packages remotely to end user machines and track the deployment status. Enable end users to install or uninstall applications by requesting for these services in the Service Catalog. Apply patches and updates automatically across the enterprise to keep your servers and workstations up to date and to simplify patch management. Take control of any workstation and troubleshoot issues quickly and efficiently. Scan workstations and other IT assets using Desktop Central and auto-populate your ServiceDesk Plus CMDB. Detect anomalies like prohibited software, unlicensed installations, and insufficient licenses and take necessary action. If you haven't downloaded the desktop and mobile device management plugin yet, you can do it now.